Managerial, administrative, financial and technical information must be effectively translated into ‘marketing’ language to persuade client organisations to allocate adequate finance for bridges on the required time schedule. Clients must produce policies and objectives for maintenance, improvement and replacement. Programmes of work and priorities will evolve from inspection and assessment information. Expenditure estimates will then enable programme revision as per financial constraints using relevant database and information systems. Validity of traffic predictions must be checked and quality assurance systems applied to design, specifications and construction. Behaviour monitoring information has an important role to play, hence the urgent need to improve instrumentation and techniques. 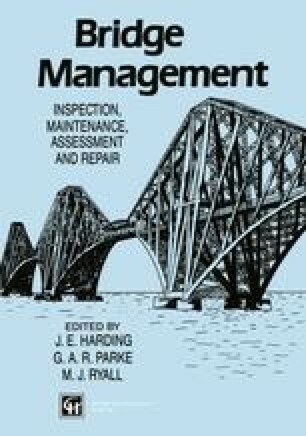 If bridge management is a coin, ‘heads’ is the marketing dealt with in this paper and ‘tails’ is the production or inspection, assessment, maintenance and repair work (Fig. 1).